There are many things in life we can get behind. 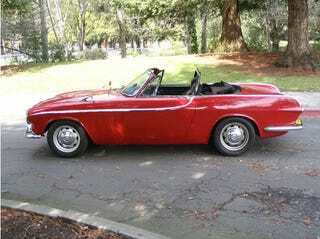 Few make as much sense as a roofless 1963 Volvo P1800 with a Ford small-block. Wanna buy it? Great news! You can! It has a Ford V8 eng w 5 speed standard trans and mustang rear end, professionaly reinforced body.Hello. The body on the car is very strong and has been well reinforced. there is no twisting. The doors have never touched the the quarter panels. Oh come on really, people. $13,555 and the doors have never touched the quarters. Hello indeed. How could you possibly pass that up?